A few weeks ago, my girls had the time of their lives. They got to play soccer with other boys and girls and have fun doing it. 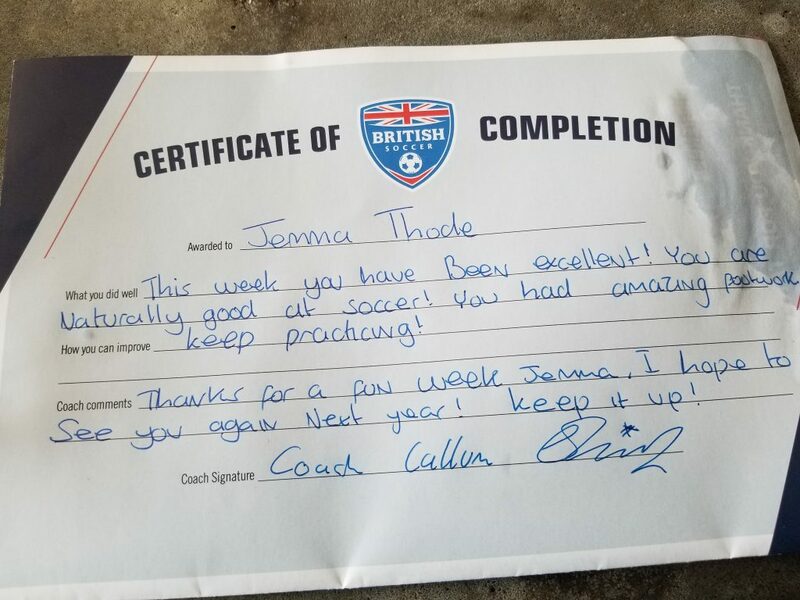 They attended the Challenger British Soccer Camp! This camp is one of my favorites because the instructors really seem to care abou the kids’ learning experience and they have fun with the kids too. British Soccer Camp runs from Monday through Friday one week each summer at different locations you can choose from. We have been to three different locations but the camp has been the same each time. They focus on skills and learning new ones while having fun doing it. My girls learn each summer and walk away from camp with a better understanding of soccer and the skills taught to them. Each summer, there is a competition among the participants. The instructors break the kids into teams (Mexico, USA, Spain, etc) and they earn points based on different games they play and exercises they do. This year, Joley had to make a flag of Mexico and bring that to camp one day. She earned points for her team by doing so. At the end, there is a winning team with bragging rights. It’s all in good fun. Jemma’s group was not doing this but she will next year when she moves up to the next level of instruction. Jemma had no less fun than Joley though. She went every day, even when super hot outside, with a smile on her face. When you arrive at camp, you receive a tee-shirt and a soccer ball in the correct size you are supposed to be using. You use your ball throughout the week and then it is yours to keep. 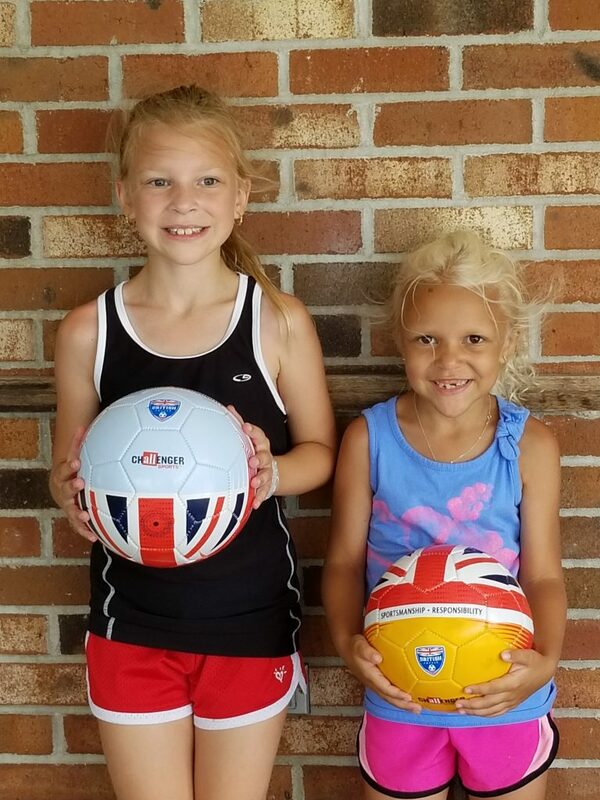 We have a small collection of British Soccer Camp balls now! They change slightly each year so it’s fun for the girls to see what they had in previous years. At the end of camp each year, the instructors give a review of the kids’ performance over the week. It’s great to see what they have to say. 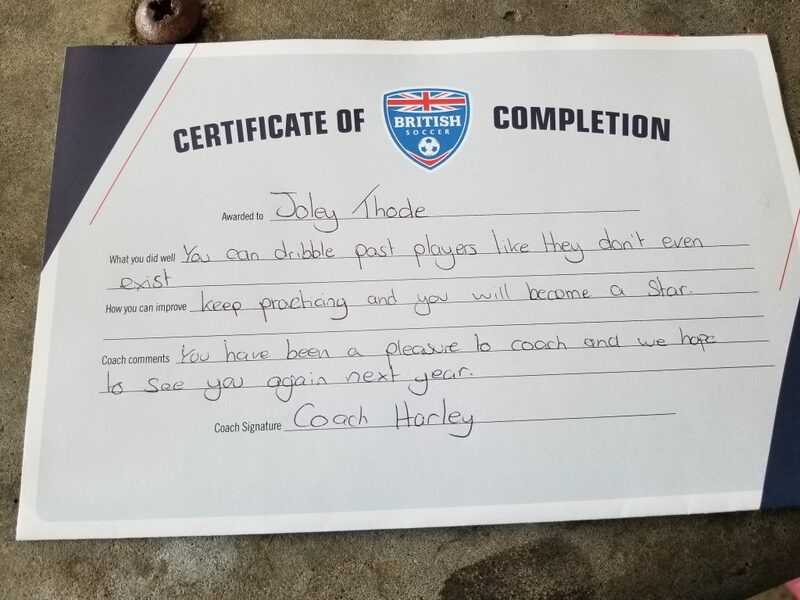 I encourage you to look into Challenger British Soccer Camp when you are looking for a fun soccer camp next year. They come to many areas and hold many camps. It is worth every penny!